We can use your existing design, modify out-dated racks to make them contemporary, or custom design a unique display to maximize your products visibility. Specializing in coated wire racks, JED Display also offers label holders, shelf dividers, corrugated, cardboard, wood, plastic, wire & wood, gravity feed and interactive displays. 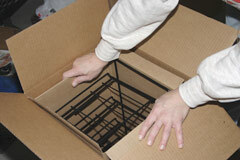 Complete turnkey services; Design, fabrication,fulfillment, instructions, packaging and shipping. Today the JED Displays website has gone online. " It is a work in progress" Says Jim Howell, Owner JED Display. "We wanted to give our customers the opportunity to see the variety of services we offer from design and fabrication to fullfillment.